A less-than-extraordinary Mouton with licorice and sandalwood on the nose, but this is still lovely and easy to drink. Medium body, good fruit and soft tannins. 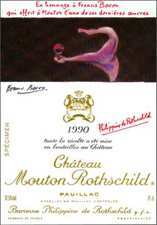 This one really turned on the charm and its was only when tasting the 1989 immediately afterwards that its very slight shortcomings (a certain blowsiness) were exposed. Glowing ruby with a foxy rim. Some brunt notes on the nose with great richness – very obviously a hot vintage. Rich, rich, rich. Blackcurrant fruit gum character. Much bigger and bolder than the 2000, for instance. Already smooth, welcoming and appetising. Much more refreshing on the palate than the nose. Quite a tingle on the finish. Some very fine tannins in retreat and definite acidity. A bit skinnier ultimately than the 1989 and slightly powdery on the finish.